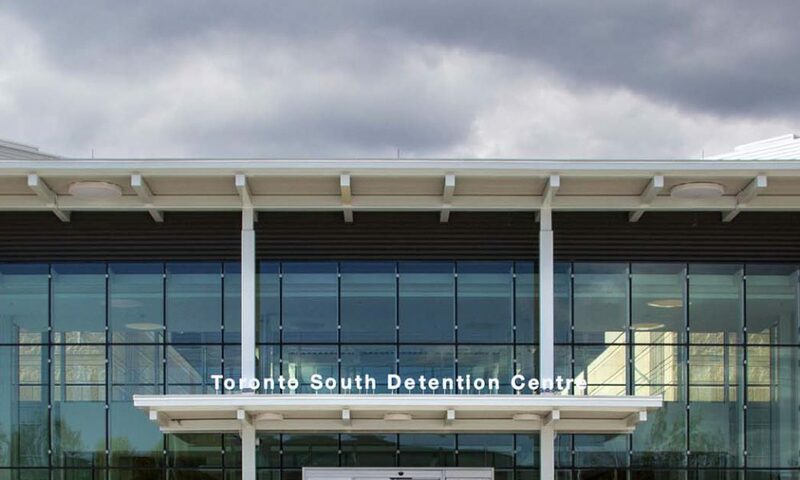 As part of a comprehensive P3 project, Mississauga, Ontario-based Habtech completed security integration involving CCTV, access control, elevators and much more at the Toronto South Detention Centre. The TSDC, which officially opened in January of this year, is comprised in part of prefabricated concrete cells, which were assembled on site. The prison is part of the Ontario Ministry of Community Safety and Correctional Services ongoing effort “to build new, state-of-the-art facilities with ultra modern features and advanced technology that enhance public safety and internal safety and security.” The 1,650-bed facility is thoroughly modern in design and includes a mental health assessment unit, a special needs unit and an area devoted to Aboriginal programs. Inmates are also able to spend time with visitors through on-site video teleconferencing technology (though in-person visits are permitted in special cases). The new facility may be a model of modernity, but it is still primarily designed for incarceration, and as such features a highly robust security infrastructure — one that was recently recognized by SP&T News’ editorial advisory board as an outstanding example of security integration. The firm responsible for that integration is Mississauga, Ont.-based Habtech, this year’s recipient of the Security Integrator of the Year award, sponsored by Anixter Canada. Judges recognized the scope of the project, as well as its complexity, plus Habtech’s ability to work with a broad range of stakeholders and contractors. For Habtech, its approach was not unlike the prefabricated cell strategy — much of the hard work was done before any of its employees even set foot in the jail. Everything had to be tested and proven well before it could be installed on site. “I think the big thing for the project in this case was that there was so much detail done with the customer before we actually got on site. A lot of the things were cleared up before we ever got there, so it made it a lot easier,” says Don Connor, general manager for Habtech. Habtech was involved with the project from the outset. As part of a P3 (public-private partnership) team led by Fengate Capital Management and general contractor EllisDon, Habtech was selected through a competitive bid process to work on the electronic security aspects of the TSDC. “In the first steps, as far as Habtech’s integration goes, what we had to do was come up with some sample products for the ministry to review so they could see [what it was going to look like] and how it was going to feel,” says Connor. “We had a lot of meetings with approximately 10 to 15 representatives of the customer. . . . We had to get all the PLCs (Programmable Logic Controller) and all the integration up and running and be able to demonstrate that it all worked at the same time. We had 29 PLC panels connected and running and functioning.” Habtech was ultimately responsible for the integration of numerous security subsystems, including CCTV, door control, a perimeter and intrusion detection system, fire alarm, lighting and power control, the public address and intercom system, as well as the aforementioned video visitation system. The company also developed a GUI for touch screen control systems and digital recording systems. Products deployed include technology from Axis Communications, Pelco by Schneider Electric, Genetec, Aimetis and Notifier by Honeywell. The infrastructure was designed using Wonderware — a first for Habtech since it usually uses its own custom software. Another first was integrating with the facility’s elevator system. “We had never done integration to elevators at this level in the past,” says Connor. “It’s probably the most complex project we’ve ever worked on.” Habtech had to work with several other parties also contracted to work on the site, including several U.S.-based security consultants, EllisDon as the general contractor, as well as Habtech’s own sub-contractors which dealt with conduits, wiring, etc. not just ours but those of the subcontractors — it was a very in-depth endeavor to make sure that we didn’t cross paths and have systems corrupt each other,” says Connor. Published in SP&T News, October 2014.